Stainmaster PetProtect Carpet Keeping it Fresh | Floors, Flooring, Carpet and More! Chances are if you have pets then you have stains on your carpets. Even without our furry friends, accidents always happen. And that is precisely what Stainmaster PetProtect carpet was made for. The SuperiaSD fiber that PetProtect is made from has inherent stain resistance, hence PetProtect carpet is MADE OF the stain resistor, It is also solution dyed so that color doesn’t fade. Stainmaster says you can even use hydrogen peroxide based cleaners with no problem on PetProtect carpet (we recommend trying that on an inconspicuous place first). The unique moisture barrier is what makes this cushion so effective at reducing stains and odors! Stainmaster has fantastically soft carpet with its TruSoft line. But if you live in a home with pets it makes more sense that you look for comfortable carpet that is able to resist stains, both new and old. Pets can be shy about where they make an accident and some time may go by before you discover the trouble spot. Stainmaster PetProtect carpet and cushion, available online and in-store at American Carpet Wholesalers of Georgia, is the winning combination you need; you get flooring with a breathable moisture barrier that helps prevent wet messes from setting in to the padding and subfloor, allowing you to more thoroughly clean and cut back on odor. To get the benefit of this system you have to purchase the Stainmaster carpet cushion. If you have pets you probably know that wet messes are not the only mess pets can create with carpet. Pet hair can build up and the Stainmaster PetProtect carpet is created with technology and chemistry that cuts down on the attractive forces between pet hair and carpet. This breakthrough increases the amount of pet hair that is removed just with routing vacuuming. 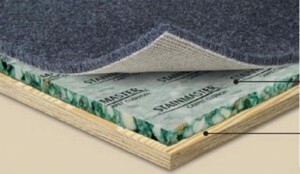 Stainmaster PetProtect carpet is constructed of Stainmaster fiber with Teflon protectant. The SuperiaSD nylon 6.6 fiber is the most durable carpet fiber on the market today. And it’s MADE from this fiber, not just treated with a surface stain resistant chemical. This nylon has built in static protection coupled with the no-fade, stain resistant qualities and you have one top rated carpet! Stainmaster offers a lot of choices in carpeting, Stainmaster PetProtect is just one of many. Getting to speak with a flooring expert at American Carpet Wholesalers of Georgia can make your selection much easier. Be sure to give us a call at 800-548-2706, When you call we can make sure you get the best Stainmaster selections at the best prices!